He is almost unusually harmonious for a Red. I like him very much! Also because he is a longrow, which comes in many places more like a spring bank. [April, 2018] I had this dram during a FoSM club tasting. The colour is amontillad and the texture shows many small tears with slow legs. The nose offers balanced peaty-malty-winey profile that is not the most complex but for sure great to nose. I like it best out of all the drams we tasted tonight. The spirit arrives warming and nicely coating in the mouth with minor peppery moments (that are not distracting at all). The taste is rich and balanced and one to chew for minutes. The finish is rather long and adds more spices and a slight dryness to the impressions, not too bad! The malty flavours grow stronger to longer you chew the dram what provides a nice transition from the winey-sweet to the barley sugary sweet flavours while the peaty notes stay in balance. Water releases more aromas in the nose and on the palate, actually I like it best when reduced to about 46% abv. Powerful, sweet clouds of smoke slowly waft out of the glass. The smoke reminds me with its slight greasiness to a smokehouse. In the first few minutes, the high alcohol content (55.9%) is noticeable with a slight stinging / cooling in the nose, but it dissipates after a while. With a few drops of water, the nose is more harmonious. Behind the strong smoke are many more flavors. Lots of sweet, red fruits (especially strawberries & raspberries) and a few wild berries, freshly cut apples, blood oranges, vanilla, salty caramel sweets, marzipan, roasted almonds and subtle hints of oak wood I perceive. Violent, strongly sweet-smoky onset with a passionate dose of freshly ground pepper. The strong Pfeffrigkeit almost flows into a "talisker-typical" chilli-catch and spreads like a slightly numbing veil in the mouth at short notice. The texture of Longrow is pleasantly oily. 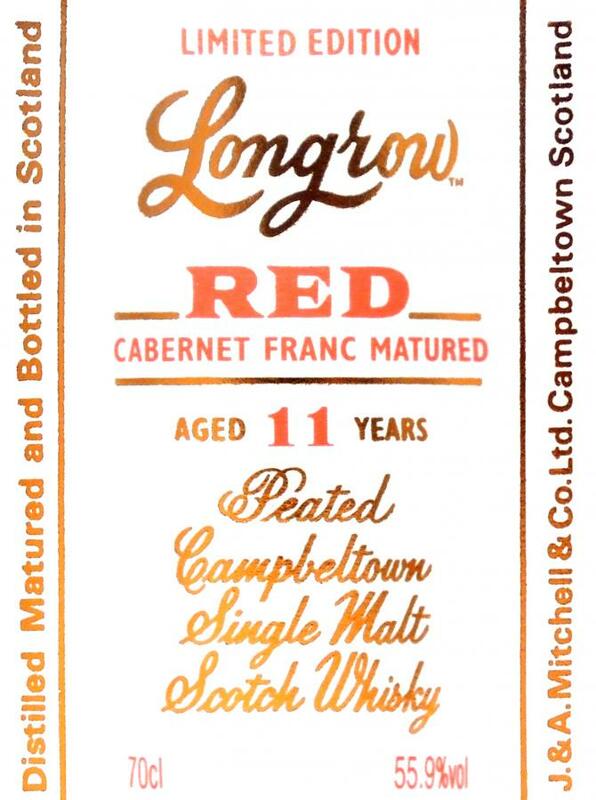 With a few drops of water, the Longrow is tamed a bit and the mouthfeel becomes silky soft. The sweet fruit flavors are now gaining more and more strength and refine the taste experience with beautiful vanilla notes and salty caramel. Strawberries and raspberries take over the sweet part, while blackcurrants and grapefruits make for a slightly sourish bite. Hints of honey, milk chocolate and oak round out the multi-layered impression. Medium to long, sweetish-smoky and peppery. Freshly ground pepper prances again briefly on the tip of the tongue and causes a slight tingle. The red fruits, which remain pleasantly sweet and slowly fade away, also dominate on the home straight. Caramel, vanilla, milk chocolate, roasted almonds and spicy oak follow. Finally, the greasy smoke builds up with dirty notes and salt again powerful and ensures a round finish. Unfortunately, this filling of the Red series continues for me the negative trend of the series. I found the first 4 Reds very successful, with the Pinot Noir it was easy, with the Malbec clearly, and here at Cabernet Franc also downhill. You do not like the used Fassarten of the respective bottlings, but you can. What bothers me about this bottling is not the wine, it's the style. The quality of the finishes. 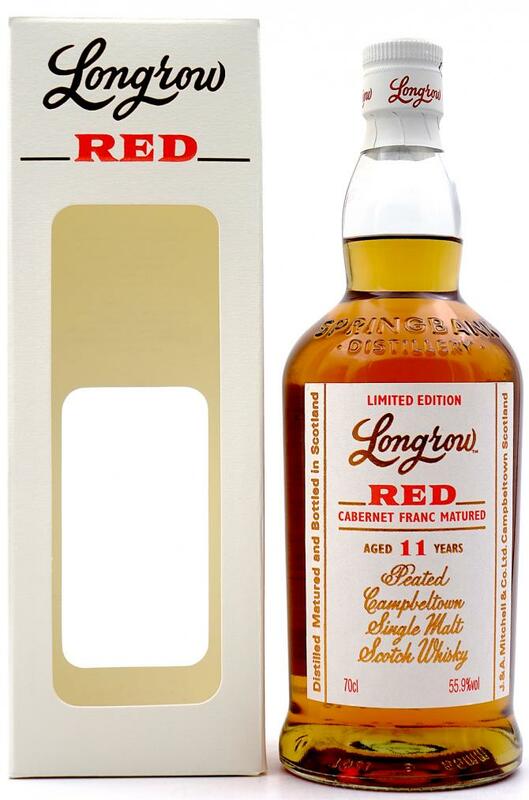 I found in the first of the series (especially the port), that the maturing / finish interweave with the character and smoke of the Longrow and create a coherent overall picture to give the malt that extra something, so this is also this year Red (2018) no longer the case. The finish is separately next to the Longrow. It looks set and not harmonious. Or to put it another way: In my first speech, the motto was "1 + 1 = 3" in the first Reds, now rather "1 + 1 = 2" remains. very nice surprise this one. amazing nose and really tasty! hides the abv extremely well, some sweet peat nice and a little complex, very civilised compared to the usual islay hits. this is a sample courtesy of Roy @aqvavitae Big Thank You Roy! would love to try a bottle to dig a little deeper but this first impression is very nice indeed! 87/88. 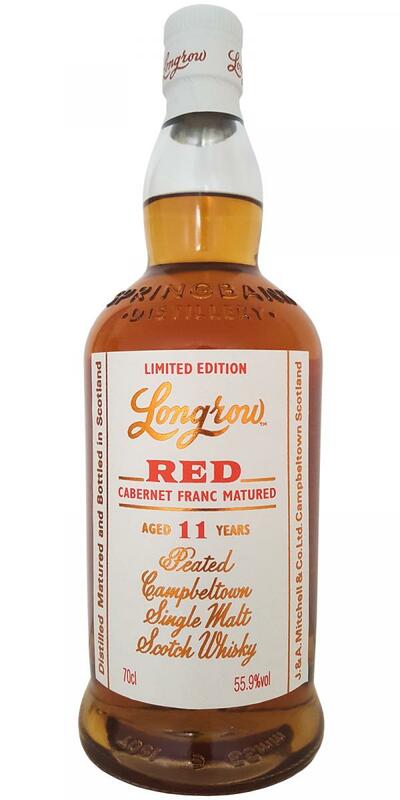 The 'Red' stamp is less applicable to this one than all the previous bottlings, both in colour and in profile. A very different one in the range. Much softer and cleaner than the very first Cabernet Sauvignon version, a more 'modern' finish. In fact it's much closer to last year's malbec cask. Peach, peat, bramble, vanilla, toffee, papaya and pastry. Peat, toffee, mango, bramble and a vegetal mark. The finish should have been able to turn out a bit longer, but otherwise: but, has its qualities, especially in the nose and at the beginning on the tongue. Fat and greasy smoke, a ham fresh from the smokehouse. The smoke is initially very engaging, only slowly opens the whisky and releases more aromas. Fruity sweetness then comes from the background, juicy raspberries and currants. With time come seasoning and salt, to leather and damp forest floor. As dominant as the smoke was at the beginning, after a few minutes it can only be perceived as an idea. Strong start with licorice and fruit, almost like these Haribo Gummidinger, where both (licorice and fruit) is off. The sweetness of grapes, raspberries and blackberries pearls over the tongue and has a lot of salt in the tow. A back and forth between fruit on the one hand and salt + seasoning (Maggi?) On the other hand. Pleasantly dry and smoky without smoldering with smoke. Not that long, too bad. The fruit sweetness remains until the end, in addition to eucalyptus and peppermint, which has a cooling effect. 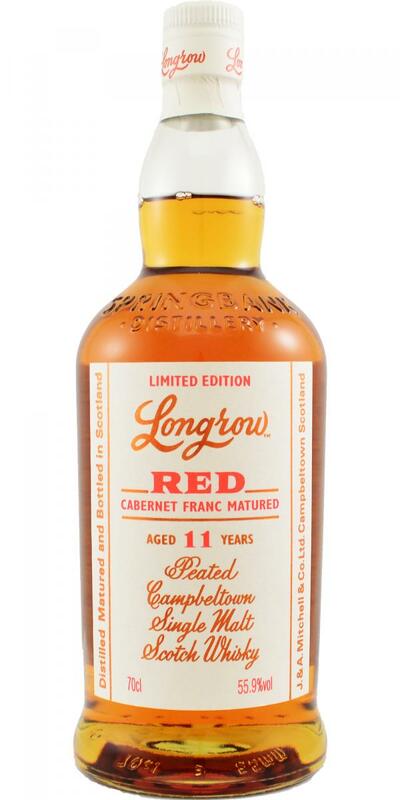 From the distillery:This Longrow Red Cabernet Franc from De Toren Private Cellar in Stellenbosch, South Africa is the follow up from the previous Malbec release from the same winery. It will be bottled at cask strength having spent an initial nine years in bourbon barrels before a final two in Cabernet Franc barriques. first a full load of sweet red wine, later spicy smoke. A mix of tantalizing caramel pudding and a subtle Springbank style.